The SPARC Swim School is designed to meet the needs of children or adults aged 4yrs – 100yrs old that want to learn how to swim and be water-safe. Lessons are run on a termly basis and roughly follow the Mauritian school terms. 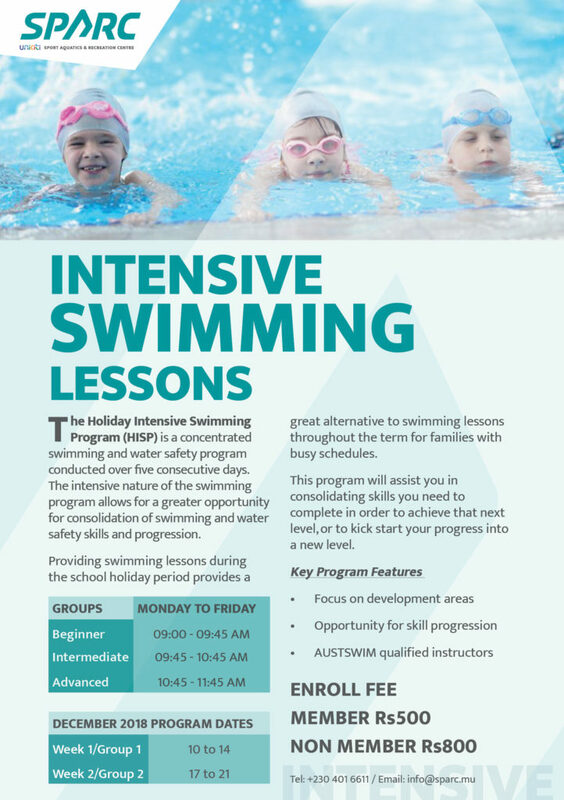 During school holidays we run a range of ‘intensive holiday programs’. For class availability and inquiries call (+230) 401 6611 or email: info@sparc.mu . The fantastic swim teachers at SPARC are AUSTSWIM qualified, one of the best international qualifications in the world. Which means your children will be taught with best-practice methods safely. New pupils are able to join lessons during any term; places will be allocated based on vacancies at the time. When children become competent at the set of skills in their current class they will be transferred to the next class without having to re-enrol; your teacher will advise when the time is right. Offered during the school holidays. These intensive courses are an ideal way to see rapid improvement. All Swim School members receive a discount on holiday courses. The course consists of consecutive lessons over five days. Our youngest swimmer should be 4 years of age and willing to go in to the pool alone with a teacher. A non-swimmers class with floatation aids. For children/adults who can swim on the front and back for a minimum of 5 metres using floatation aids and can put their face in the water. For children/adults who can swim 5 metres on front and back with no floatation aids and can jump into the water on their own. If swimmers are able to swim 50m they are encouraged to enrol in the SPARC Swimming Academy. The Swim Academy has groups for both competitive and social swimmers. Classes are offered for beginners or for more advanced swimmers in the pool. Our teachers will guide you safely towards confident swimming using the latest skills, equipment and fun. As the SPARC swim school continues to grow, we will add more levels and programs to continue innovating and developing a great swimming program for our members. If you are already an Adult member of SPARC and you would like to do a private swim lesson then you only have to pay for the lesson since you are already a member. There are many options to choose from for your weekly session. Numbers in each class are strictly limited. Dolphin Beginners = 6, Intermediate = 8, Advanced = 10 per class. The (HISP) is a concentrated swimming and water safety program conducted over five consecutive days. The intensive nature of the swimming program allows for a greater opportunity for consolidation of swimming and water safety skills and progression. To book your spot in a class call (+230) 401 6611 or email: info@sparc.mu .